CAD strengthened yesterday against USD amid the publication of weak data on the US labor market. Initial Jobless Claims in the US rose to 253K against the previous 200K in a week. USD is under pressure from the decline in Chicago PMI to 56.7 points from 63.8 points. Macroeconomic data from Canada were ambiguous and did not have a significant impact on the national currency rate. Canadian GDP in November fell by 0.1%, as expected. The Raw Materials Price Index rose by 3.8% in December, and the Industrial Product Price Index in December decreased by 0.7%. During the day the market will be waiting for the January data from the US labor market. The unemployment rate is expected to remain st the same level of 3.9%. Nonfarm Payrolls are expected to reduce from 312K to 165K. Today's data may be better than expected, as the leading indicator of ADP Nonfarm Employment Change exceeded market expectations and amounted to 213K. In this case, the strengthening of USD will continue. Resistance levels: 1.3180, 1.3200, 1.3230, 1.3287, 1.3320, 1.3376. Support levels: 1.3119, 1.3080, 1.2972, 1.2884, 1.2781. Short positions may be opened from the level of 1.3110 with target at 1.3050 and stop loss at 1.3140. 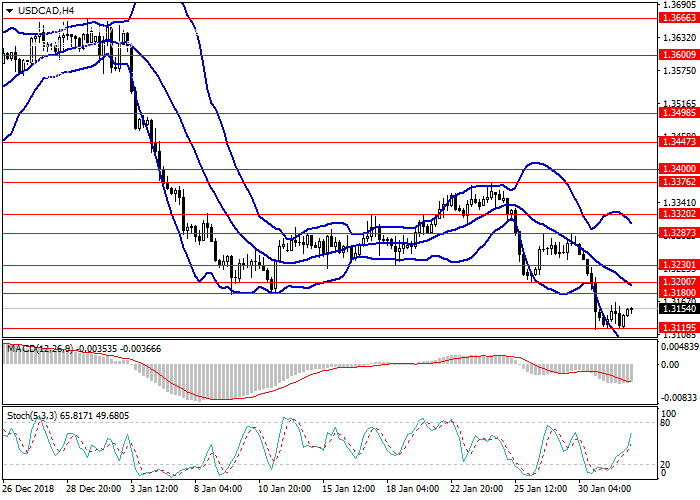 Long positions may be opened from 1.3200 with target at 1.3280. Stop loss – 1.3170.